Healthcare, financial services, and military training may not seem like they have much in common, but all of them are on the cutting edge of three new technologies that have the potential to revolutionize education: the Internet of Things (IoT), virtual reality (VR), and artificial intelligence (AI). But while these new technologies promise richer experiences for students and fewer hassles for teachers, they also magnify the strain placed on schools’ IT networks and complicate schools’ cybersecurity considerations. To get ready for these big changes on the edtech horizon, educators need to familiarize themselves with what each of these technologies can do — and how their districts can prepare their IT infrastructure to support them. The Internet of Things consists of all non-computer objects that have computing powers and are connected to a network. In the consumer sphere, the IoT is populated by devices like smart locks and smart thermostats, but IoT technology has practical applications in nearly every industry, including education. For example, schools can use IoT devices to reduce energy costs and bolster physical security. In fact, by installing smart light fixtures that respond to natural lighting conditions, Connecticut’s Cheshire Public School District lowered their electricity bill by a remarkable 84%. IoT devices also have the potential to improve the efficacy of classroom instruction. For instance, IoT-enabled ID cards generate data on how students’ movements and interactions throughout the school day correlate to achievement, leading to valuable insights about student behavior and learning. That said, when it comes to keeping a record of students’ movements, security must be the top priority, and schools must make every effort to secure their networks against hackers. Virtual reality refers to computer-generated environments that simulate sensory experiences. Typically, users wear headsets like the Google Cardboard or Sony Playstation VR to immerse themselves in a simulation, although some facilities boast entire VR rooms. While VR is best known for enabling immersive gaming experiences, the technology is also a popular tool for medical and military training. The possibilities for VR in the classroom are virtually endless. Students can go on virtual field trips to Ancient Rome or the human digestive tract or, like the fifth graders at Lincoln Elementary in California, they can interact with 3D renderings of plants, animals, and geographic features. Teachers in Singapore have already noted that students’ answers to questions are more in-depth and nuanced following a VR experience, and a recent study commissioned by Samsung shows that 85% of teachers agree that VR would help their students better understand learning concepts. 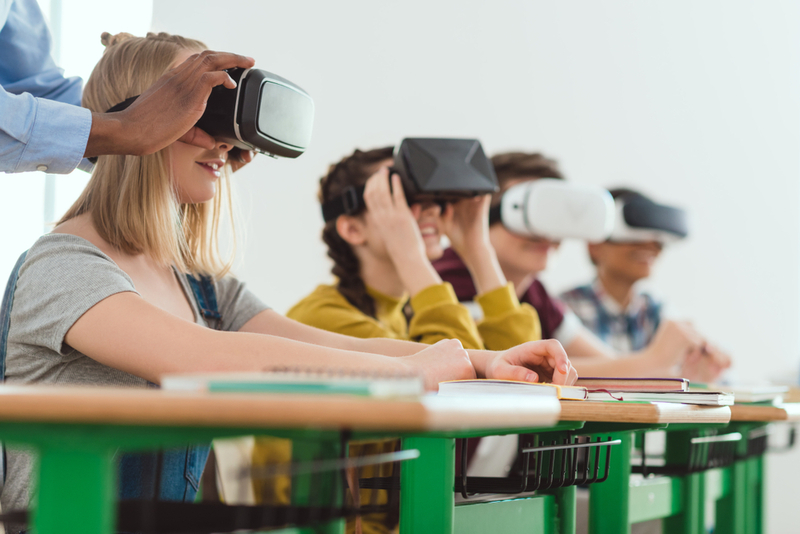 While its benefits are obvious, implementing VR in the classroom isn’t without its challenges. Just one minute of VR content can require up to 40 terabytes of uncompressed bandwidth or 500 gigabytes of compressed bandwidth, and schools must ensure that their wireless networks can handle this massive spike in demand. Further, like any IoT device, VR headsets can introduce security vulnerabilities if not properly protected. Artificial intelligence refers to any sort of algorithm that can complete complex tasks in a way that mimics human thinking or problem-solving. One well-known subset of AI is machine learning, wherein computers make progressively better-informed decisions based on the outcomes of their past decisions, much like a human would. Another is natural language processing, which allows humans to interact with AI-powered machines using the same language they’d use to interact with other humans. Due to its potential to relieve human workers of tedious tasks and provide important new analytical insights, AI is becoming increasingly popular in several industries, including healthcare, financial services, and marketing. It can offer the same value in education, taking over rote tasks like grading and attendance and illuminating patterns to highlight the most successful teaching strategies. And while AI is far from supplanting teachers, it could soon help moderate small-group discussions, relieving teachers of the burden of basic classroom management. Unfortunately, a Carnegie Mellon professor has noted that some school districts lack the resources necessary to support AI technology, and that many educators aren’t tech-savvy enough to integrate AI into the classroom effectively. That’s why schools need a technology partner like Epiphany that provides network assessments, monitoring services, and teacher training to ensure that they’re ready to both support cutting-edge edtech and keep students — and their data — safe.